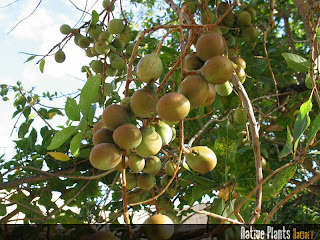 The soapberry tree is in a large family of plants called Sapindaceae. Other well-known family members include maple, horse chestnut, lychee, longan, and rambutan. There are a number of different species of soapberry. Common in Hawaii and Florida is the Hawaiian Soapberry, Sapindus saponaria and Sapindus oahuensis. And in Florida, of course, it’s called the Florida Soapberry. 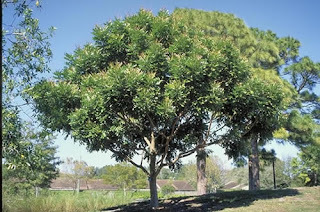 The Soapberry is a tall deciduous tree, growing up to 80 feet in height. In Hawaii, it grows from mesic (moist) forests to dry forests. In general, mesic forests receive less rainfall than rainforests but do not suffer actual moisture shortages. The trees are salt, wind and drought tolerant. Even though they are naturally found at fairly high elevations ranging from 3,000 to 4,500 feet, they will flourish in low, dry urban locations. The genus name, Sapindus, is derived from Latin sapo, meaning soap, and indicus, Indian. When soap nuts are moistened, crushed and rubbed together, they produce a soap-like lather. This was used as a cleaning detergent by Native Americans and is still used as such in tropical countries. Saponin is an active ingredient in soap nuts making the soap an antimicrobial natural detergent. Jewelers use it to clean precious metals. As for medicinal properties, the soap solution is able to treat eczema, psoriasis and head lice. It is reported to have anti-tumor properties as well. Lately, soap nuts have enjoyed resurgence among those looking for an environmentally friendly alternative to chemical detergents. For laundry use, the directions are simple: put a handful of soap nuts in a mesh or cotton bag and place in the washing machine with the dirty laundry. Soap nuts are said to be safe for wool, silk and other delicate fabrics. And best of all, doing the laundry with soap nuts leaves your clothes incredibly soft without the need for fabric softeners or conditioners, so it is reported. Visit www.loadsoflove.com for more information on using soap nuts as cleaning agents and for purchase.